At 4 am I woke up, thinking I'd heard the doorbell. I tried to imagine why someone would ring the doorbell at that hour, and because of my enduring faith in humanity my only answer was that someone was looking to rob me blind but wanted to make sure I wasn't home first. As soon as they saw me switch on a light to answer the bell, they'd bolt. This would not be the smartest tactic for a robber, but such fine specimens aren't known for their Mensa candidacies. As some of the haze of sleep faded, I realized it had to be my imagination. It couldn't have been my doorbell. The sound I heard was the normal "ding-DONG," and my doorbell doesn't sound like that. My doorbell is a loud burst of high-pitched buzzing. It sounds more like something you'd hear in a prison when the guards open the cell doors. Whenever anyone rings it, I jump out of my seat and am immediately angry at whoever pressed it. It's horrible and stupid. So, I forgot about it and dozed off. Minutes later, I awoke certain I'd heard the doorbell again, and this time it was more like my actual doorbell. It wasn't quite as loud or annoying, but it was the right pitch, and it wasn't that pleasant, sing-song chime. Of course, I ended up leaving bed and peering out the shades to the predictably empty front walk. 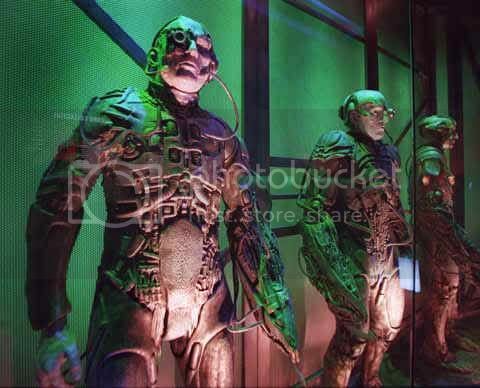 My imagination is Borg. If my reason wins the day and convinces me my fears are unfounded, my imagination will endlessly adapt to counter my intellect. If I'd continued to try to sleep like a normal person, my imagination would have continued to evolve the scenario. The doorbell would repeat, and would become indistinguishable from the real one. Eventually, I would see phantom shapes outside my window, ready to strike. I would find a note on my nightstand reading "Dear Mick, Your doorbell is ringing. Love, Hulk, Zeus, and Jesus." Cute story, and well described. But, you know, you could spin this yarn into a short story like an alchemist makin' gold.